Websites can crash at a moment's notice. And, no matter how prepared you think you are, a "viral" event can exceed even your wildest imagination! This happened recently with Yes You Can! Diet Plan (YYC) and Alejandro Chaban (an EndLayer client) during a live video appearance which aired on Sunday January 19, 2014 at 9PM EST. EndLayer regularly works with our clients to prepare for traffic surges and this Sunday night was no different. YYC let us know to expect a traffic spike, but did not know exactly 'how much' to be prepared for. EndLayer began to proactively monitor the server starting at about 9PM EST. 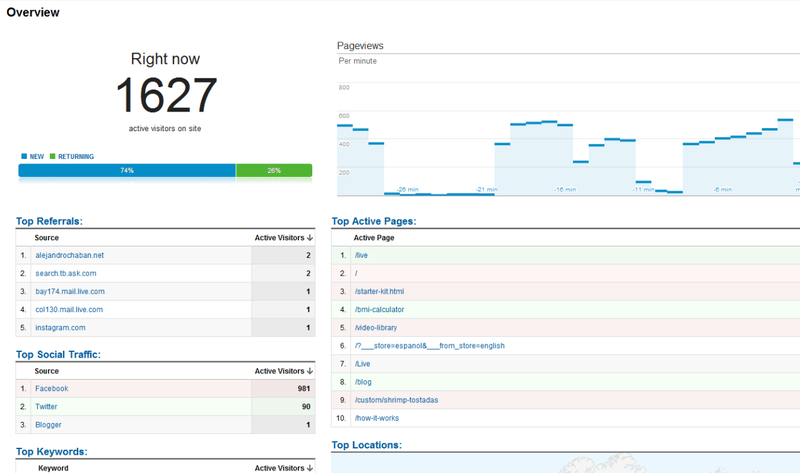 At 9:15PM EST, over 1,600 people were navigating the website simultaneously. The website was now on track to receive over 30,000 unique visitors in a little less than 2 hours! This type of traffic can lead to performance issues and eventually a total crash (disaster) if not handled properly. Within minutes of the website going offline, EndLayer engineers coordinated several modifications and upgrades to the server to accommodate for the additional influx of visitors. "It's important that you don't over-upgrade a server in panic-mode, and that you only make the most necessary adjustments to the critically-impacted areas of the server architecture", said Justin Basch, a member of EndLayer's management team. This granular approach to diagnosing and resolving issues helps EndLayer clients save money and prevent unnecessary down-time. While troubleshooting, EndLayer engineers noticed that the majority of Yes You Can! Diet Plan's website traffic was pointing to specific pages on the domain. Our engineers then moved quickly to ensure that those specific pages were heavily cached and optimized. EndLayer stuck around until the "green light" was given that the coast was clear; ensuring that everything possible was being done to keep key operational processes functioning properly. "As an e-commerce business, we have very stringent hosting requirements because any downtime could be catastrophic for us. The team at EndLayer approaches every situation with true professionalism & incredibly fast response times. I can't say enough about how hard (& smart) these guys work and how happy we are to be working with them – a rare catch these days in the IT industry!"